Dr. Meserkhani will clearly explain the dental implant procedure. Until recently, many patients were unable to receive dental implants due to certain health conditions or lack of strong, healthy bone to anchor the implants. Using recent breakthroughs in implant technology, Dr. Meserkhani can provide dental implants to more people than ever, often with local anesthesia only. Dr. Meserkhani, is highly trained implantologist in Glendale, CA and his expertise ensures the longevity and reliability of your dental implants. Using state-of-the-art technology he is able to precisely plan your treatment so that it is efficiently and 100% correctly done. Dr. Meserkhani is a leader in the field of implantology, and he is a sought-after lecturer on the procedure. He is a Fellow of the American Academy of Implant Dentistry and a Diplomate of the American Board of Oral Implantology, a certification awarded to less than 400 dentists in the United States. Dr. Meserkhani is a skilled surgeon as well as a master restorative dentist. He uses his unique training and extensive experience to look at the overall picture of your mouth, taking into consideration the harmony, aesthetics and function. To determine whether you are a candidate for dental implants, Dr. Meserkhani will meet with you to review your dental and medical history, learn about your lifestyle and understand your goals for your oral health. He will listen carefully to your concerns, explain options for treatment and answer all your questions about getting dental implants. Dr. Meserkhani is a specialist in dental restoration, and he will use his advanced training and years of experience to give you new teeth that look and feel perfectly natural. 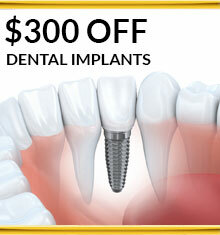 If you decide to have a complete implant procedure, you will receive a $300 discount on your implant placement! A dental implant is considered to be the best option for replacing a single missing tooth. Dental implants are a modern miracle that can be used in a variety of applications to replace a missing tooth, or teeth. Replacing a single tooth. 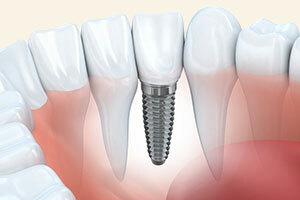 Most dentists agree that a dental implant is the best option for replacing a single missing tooth. A dental implant looks, feels and functions like a natural tooth. With proper care, an implant can last a lifetime. Replacing multiple teeth. There are several options for replacing multiple teeth, depending on the number of teeth that are missing. We can use multiple single dental implants, implant-supported bridges or implant-supported partial dentures. Replacing all your teeth. If you are missing all your teeth, or have teeth that simply cannot be saved, we can provide you with implant-supported dentures, fixed implant-supported dentures or multiple implant-supported bridges. Using a revolutionary procedure that Dr. Meserkhani was instrumental in pioneering, he can now provide you with a full set of beautiful New Teeth in One day. He uses four dental implants per arch, and the implants inserted at angles for maximum load support. You will receive a beautiful set of temporary teeth the very same visit. Learn more about our same day dental implants. Dentures that are supported by dental implants don’t slip, don’t require adhesives and allow you to speak and eat normally. Dentures are fitted with snaps that attach to the implant posts and can be stabilized with as little as two implants per arch, although using more implants provides better support and increased chewing ability. These dentures are cemented or screwed into place and can only be removed by a dentist. Fixed dentures “emerge” naturally from your gum line without covering your palate and interfering with your sense of taste. They also provide greater stability, prevent slippage and increased chewing capacity. Both types of implant-supported dentures deter bone loss and provide a “facelift” by returning the contours of the lower face to natural proportions. 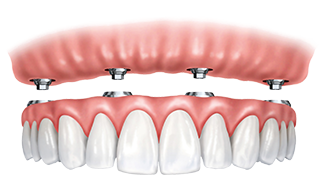 Implant bridges are the most stable, life-like teeth option for replacing multiple missing teeth or all missing teeth. Their flexibility provides comfort and chewing capacity which is almost completely restored to normal. When all teeth are missing, our doctors place four three-unit bridges made of high quality, durable porcelain onto eight dental implants in each arch. Learn more about our tooth replacement options. When are Dental Implants the appropriate solution? Dental implantology can be beneficial to a wide range of patients. Almost anyone who is missing a tooth or teeth, and is in good overall health is a candidate for implant treatment. Some health conditions, such as diabetes and smoking can reduce the success rate of the procedure; however, there are very few instances when implants are considered to be completely inappropriate. One of the most important considerations is the quality and quantity of bone that is available to secure the dental implant. 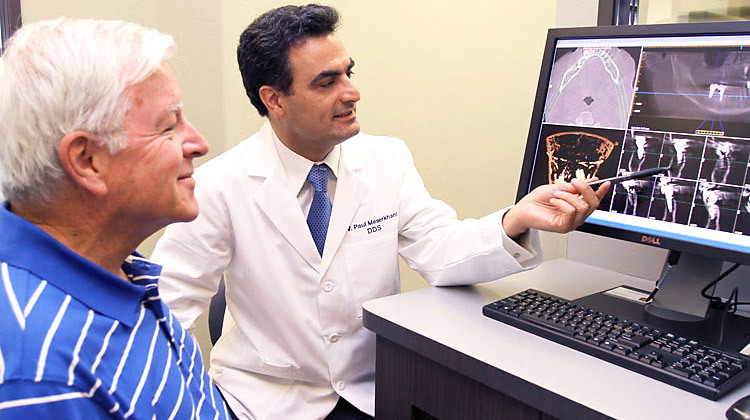 In these cases, Dr. Meserkhani often use advanced bone grafting techniques to augment bone, making it possible for most people to benefit from dental implants. Dr. Meserkhani and Dr. Alexanians use images captured by our cone beam CT scanner to plan the precise location of implants in advance. Dr. Meserkhani has equipped the practice with state-of-the-art equipment, and he takes full advantage of this technology to provide the finest and most comfortable treatment for our patients. He uses CT cone beam scanners to capture three-dimensional images of your head, face and jaw. In some cases, Dr. Meserkhani uses platelets rich in growth factors to accelerate healing and Emdogain growth proteins to stimulate regeneration of gum and bone tissue. After your initial consultation and examination, Dr. Meserkhani formulates a treatment plan based on your specific needs, desires and budget. In some cases, extractions, bone grafting, implants and temporary restorations can be placed the same day. 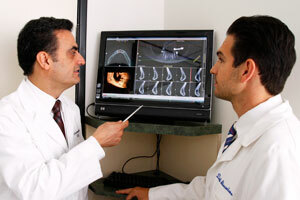 Dr. Meserkhani uses information gathered from the CT scans to begin planning your implant procedure. This highly detailed information helps him locate the densest bone and fabricate surgical guides to assist with precisely placing implants in the optimum location. Having the tools to pre-plan your implant surgery allows Dr. Meserkhani to select the exact size, diameter, location and angle of implant post to be inserted, making the actual surgery a very precise and minimally invasive procedure. By pre-planning it is also often possible to do the whole procedure in the same day in many cases. No need to go to another specialist you can be treated in the comfort of Dr. Meserkhani’s lovely office. When a tooth can’t be salvaged, Dr. Meserkhani uses a combination of traditional surgery and lasers to gently extract the tooth and preserve the socket. Placing an implant immediately after extraction deters jawbone loss that occurs when a tooth is not present to provide the stimulation necessary for bone growth. Immediate placement may eliminate the need for future bone grafting and for experiencing other complications, such as a collapsing facial structure. Dr. Meserkhani has placed thousands of dental implants over the years and has an exceptional success rater of greater than 98%! When there is not sufficient bone to support a dental implant, Dr. Meserkhani can augment your existing jawbone using advanced techniques for bone grafting. Bone grafting can restore the strength and density of bone so that an implant can be successfully fused with your jawbone. When teeth in the back of the jaw are missing and not replaced, bone will be resorbed and the sinus cavity can “fall” down into the area where jawbone used to be. As implants can’t be placed in an empty space, Dr. Meserkhani will surgically lift your sinus and augment the upper jawbone to provide adequate support for a dental implant. Learn more about Bone Grafting & Sinus Lifts. Your comfort is our top priority and we firmly believe in TLC. We always maintain communication with you, offering reassurance when needed, and we also offer the option of sedation to help you relax. Dr. Meserkhani performs the majority of dental implant procedures using a simple local anesthesia, with patients feeling no discomfort. However, for patients that are very anxious, we can provide either oral or IV sedation to help you relax into a “twilight sleep” during your treatment. You are fully conscious and can respond to questions or requests, yet you feel no sensation of pain. Dr. Alexanians is one of the leading IV sedation dentists in California and assists Dr. Meserkhani when patients would prefer to be asleep during the implant procedure. Dr. Meserkhani works closely with our top-notch in-house lab to provide restorations, such as crowns, bridges and full denture arches that look natural and fit comfortably. The president of our lab is Allen Meserkhani, a Certified Lab Technician with over 30 years of experience, and many of our technicians have over 20 years of experience. You can be assured that your restorations will be of the highest quality available, and are the proper shade, shape and size to complement your personality and facial characteristics. Tom received crowns and dental implants. “I like the personal interest and concern all the dentists show, and the full explanations of alternatives and specific recommendations. The office has a nice, natural and relaxed environment and the people are very friendly and professional. “They have latest equipment and procedures – now also full service with implants and periodontal care. The work is beautiful. They are all specialists and know what they are doing. “I get lots of comments on my “beautiful smile” teeth and smile. My crowns and implants are 100% serviceable with no problems. In this case, the patient had a failing bridge and the abutment teeth were hopeless. The site received 3 root form implants and 3 ceramic crowns to complete the site. These photographs represent typical results, but not everyone who undergoes the procedure may achieve the same outcome. Our patient in these before-and-after photographs had a bridge which failed several times causing additional damage. The situation was managed by implant placement for missing teeth and ceramic crown. The patient had periodontal disease, failing teeth, bone loss, and esthetic concerns. Treatment consisted of gum treatment, followed by bone grafting and implant placement. When implants integrated after two months, ceramic veneers were used for anterior esthetics and ceramic crowns were inserted to replace posterior teeth. Here, a combination of implants and ceramic crowns were used to replace and restore the patient’s smile. These photographs represent typical results. 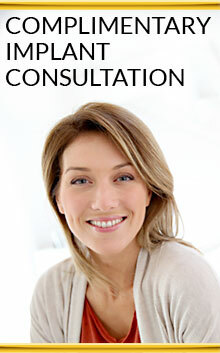 Let our specialists consult and inform you about your dental procedures. In this scenario, our patient had a complex dental situation which needed immediate attention. The treatment consisted of saving some of the patient’s teeth with a combination of dental implant in order to give him proper esthetic and function. This patient received gum treatment, bone augmentation, and root form implants for a perfect esthetic and functional result. Consult with our experts at Los Angeles Dentists Group about your dental needs and know as much as you can about your specific case. Dental Implants to replace failing teeth. Removable partial replaced by fixed teeth supported by dental implant. Cosmetic dentistry techniques were used to align this patient’s smile. This patient had lost a tooth in an accident. It was replaced using a dental implant and ceramic crown. This patient had lost their two front teeth due to an infection. She received implants and ceramic veneers to restore her smile right before her wedding. We were happy to help this patient restore her smile before her big day. Another actual patient’s before-and-after photos. Dental implant was used to replace missing lateral incisor and ceramic veneers used to enhance the esthetic of central incisor to create a perfect smile. Our patient in this case, came in with infection, severe gum disease, and failing teeth. His treatment consisted of periodontal treatment, bone graft implant placement, and ceramic crown. This patient received a combination of dental implants and porcelain veneers to restore their smile. This patient had a combination of dental implants and cosmetic work. They replaced the problematic teeth with dental implants and ceramic crowns. View more before and afters in the Smile Gallery. You can come in for a Complimentary Dental Implant Consultation and learn more about how dental implant treatment can benefit you. Give us a call and we will be happy to schedule your appointment! Problems with your previous Dental Work?